Two weeks ago on a regular Wednesday night I was crewing on a good friend’s sailboat. We had a great race in very shifty winds and crossed the finish line in second place in our division. Only to realize that a change in the course we thought had only applied to div1 and div2 also applied to us. We had rounded the wrong windward mark on the third rounding. Having figured it out before the race committee did, and to avoid any later protests in good sportsmanship we informed the race committee that we would retire and forfit the race. Another boat close to us who had sailed the same course as us was adamant that they had sailed the right course and was going to protest the race committee. Having retired our thoughts were already turned to putting the boat to bed and pulling the beers out of the ice box once we were tied to the dock. So I still don’t know what happend with the protest. 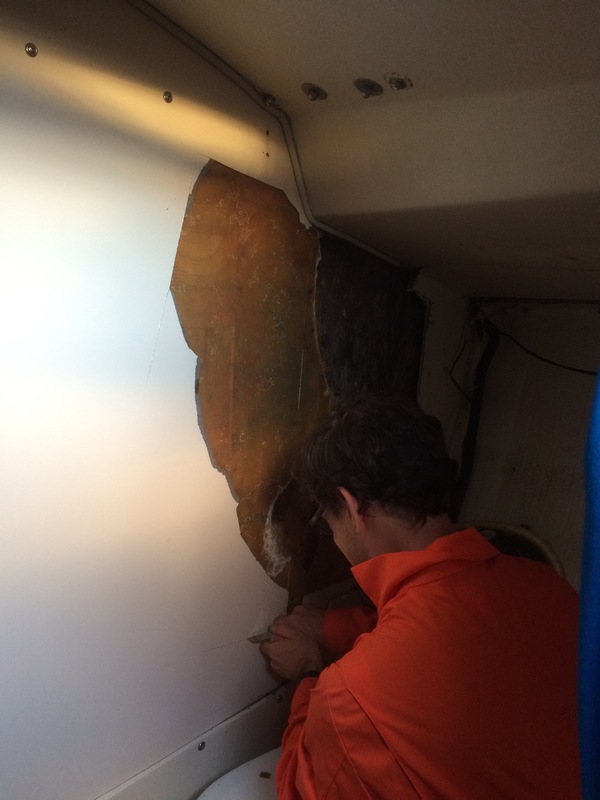 What happened after that is that one crew member noticed two small cracks in the gel coat of the central bulkhead of the boat on the port side where the chainplate is bolted. We had a lively conversation about what it meant and how extensive the repairs might have to be. The following Wednesday the crew came back to help prepare the boat for repair. Remove as much stuff as possible from the boat and detach the shrouds from the port chainplate and then remove the chainplate bolts. 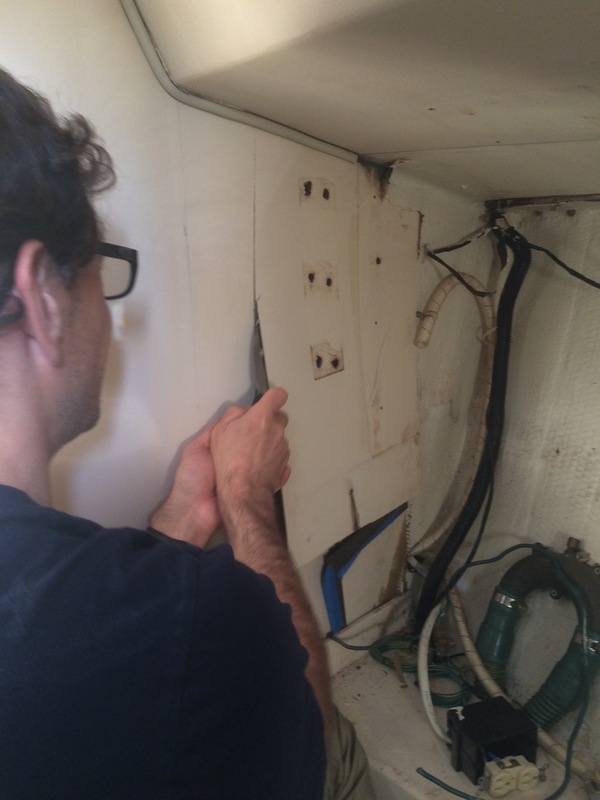 The next Wednesday we started to explore and cut into the forward side of the bulkhead to see what had caused the port chainplate to move up and crack the bulkhead Fiberglass. What we found is that the location where the chainplate goes through the deck has historically not always been well sealed. Water had come through and seeped into the bulkhead which is a sandwich of Fiberglass and balsa wood core. The sandwich of balsa was saturated and the wood was rotten and soft which compromises the strength of the bulkhead. So what next? Clean out the rotten balsa replace it and re-glass? Or replace the bulkhead entirely? That is the question we are asking ourselves. Today I tackled something new, cutting the gains on the garboard so that the second strake appears to taper nicely to meet the profile of the garboard as it gets to the bow and stern stem. To accomplish this I needed a rebate or a shoulder plane, which I don’t yet have in my tool kit. So I got a membership to the Vancouver Tool Library to allow me to access the tools I don’t yet have. As you might imagine shoulder planes or rebate planes are not super common tools, but they are precisely what makes the tool library such a wonderful service. I can easily imagine some kind of franchise where clusters of a few blocks have something similar.